Summer has just ended, according to the calendar. But for most of us, it’s been over since Labor Day. Kids are back in school; others are back at work. Those long, luxurious days at the beach are just memories now. Getting back into the swing of things means that schedules become a bit (or a lot) more hectic, and one of the outcomes of rushing around is that meal planning and eating healthful meals become a struggle. Who has time to eat breakfast or make lunches when you’re rushing out the door? And when you straggle home later in the evening, it’s so tempting to order takeout instead of cooking a meal. Of course, every now and then this is fine, but a steady diet of energy bars and fast food can wreak havoc on your waistline, your blood sugars, and your health. There has to be an easier way, right? Well, there is! In fact, you probably have the tools to make healthy, easy, and fast meals right in your kitchen. Let’s take a look. Chances are, you have a favorite mug for drinking your morning coffee or tea. But did you know that you can make a meal in a mug, too? Would you believe: chicken pot pie, lasagna, omelets, soup, and hot cereal? Benefits: Meals-in-a-mug have a lot going for them. They’re made in the microwave, which means you don’t have to heat up the oven. They don’t take all that long to make (perfect for early mornings or late at night when you’re short on time). And most of the recipes are geared for one serving, although you can easily double, triple, or quadruple the recipe, as well. How to: A quick search on the Internet will point you to more mug recipes than you can imagine. In addition, Amazon has a number of mug-meal cookbooks, and you’ll be certain to find one that suits your tastes. You can find mug recipes that fit your dietary needs, as well, such as low-carb, vegan, and gluten-free. And for many of the recipes, you’ll prepare and cook your meal right in the same mug, which saves you from having to wash a lot of bowls. You can find healthy mug meal recipes here. Tips: Of course, not all meal mug recipes are healthy. For example, Nutella Lava Mug Cake — it looks decadent, and no doubt, it is decadent. Plus, it’s brimming with calories, fat, and carbs. Search for recipes that provide a balance of nutrients so that you get some healthy carb in the form of whole grains, some protein (think eggs, chicken, fish, lean meat, tofu, or beans), and vegetables. Also, go for recipes that use a healthy fat, such as olive, canola, sunflower, or safflower oil. Maybe mug meals don’t appeal to you. Or you’d rather not have to use the microwave. Meals in a jar may be for you, then. If you have some of your grandmother’s Mason jars collecting dust in your basement, dust them off and put them to good use. There’s no end to breakfast, lunch, and dinner meals that are made and eaten right out of the Mason jar. Benefits: As with mug meals, Mason jar meals are quick and easy. They’re also highly portable, making them perfect for bringing to school or work. And, you can make up a number of Mason jar meals all at once so that you have them ready to go for the upcoming week. How to: One of the easiest and most portable Mason jar meals is called “overnight oats.” There are many versions of this recipe (and you can tweak any recipe to make it your own). Start with uncooked rolled oats and add milk or a milk alternative, such as almond milk. Then, add a dollop of plain Greek yogurt, a tablespoon of chia seeds, a pinch of cinnamon or a teaspoon of vanilla, and, if desired, some raisins or other type of dried fruit. Stir everything up in the jar and stick it in fridge overnight. In the morning, add some nuts or fresh fruit, if desired. And if you like your oatmeal warm, heat it up in the microwave (just be sure to take the metal lid off first, or else empty the jar into a bowl). Check out an overnight oats recipes here. If you don’t care for oatmeal or you want a lower-carb breakfast, mix up a couple of eggs with some spinach and shredded cheese in a bowl, then pour into your jar and microwave it for about two minutes, checking often. Salads are also well-suited for Mason jars, too. The key to sog-free salads is to put your salad dressing in the jar first. Then, layer in your choice of protein (cooked chicken or beans work well). Finally, add your salad greens and other vegetables. There are so many variations of Mason jar salads that you’ll never get bored. Need inspiration? Try some of these recipes. 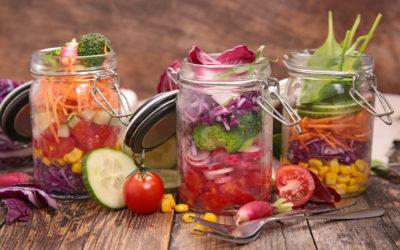 Tips: As with mug meals, the key is choosing healthful ingredients for your Mason jar meals. Whole grains, such as oats, quinoa, farro, and brown rice provide healthy carbs, fiber, and vitamins and minerals. Whenever you cook grains, make extra — that way, you can use them in your Mason jar meals. Beans and lentils are a great meatless source of protein (and you can buy canned and precooked varieties). Nuts, seeds, and olives provide healthy fats. Add flavor and variety by using salsa, hummus, or pesto. Who knew that cookie sheets aren’t just for baking cookies? Would you believe you can make your entire dinner using a sheet pan? Forget about washing all of those pots and pans. Sheet pan dinners are easy and efficient, and there is an endless supply of recipes available so that you and your family will never get bored. Benefits: Besides the convenience factor, sheet pan dinners (or lunches, for that matter) can provide a number of food groups and nutrients all on one cookie sheet. Because you cook everything in the oven at once, you end up saving time, meaning that you can prepare and serve a healthful meal. How to: Make cleanup easier by lining your sheet pan with parchment paper or foil sprayed with a little cooking spray. Try to use ingredients that take about the same amount of time to cook (for example, thinly sliced chicken breast and asparagus). It helps if you cut up slower cooking vegetables, such as squash, more thinly, and leave quicker-cooking vegetables, such as broccoli, in thicker chunks. 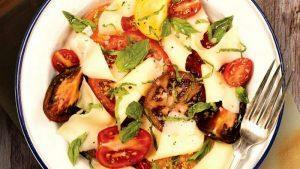 Toss vegetables with a light coating of oil and season them, as well. You can cut your choice of protein, such as chicken or meat, into chunks, or leave them whole. Some recipes will call for wrapping your protein in parchment to help retain moisture. To get you started, try these recipes. Tips: Most sheet pan meals will take between 45 and 60 minutes to cook. If time is tight, you can prep everything in the morning before you head out the door. Then, when you get home, heat up the oven and slide the pan in. Purchase a good quality sheet pan made from aluminum or stainless steel. For more tips and ideas, visit this website. There are plenty of recipes and ideas to get you started with mug meals, jar meals, and sheet-pan meals. However, don’t be afraid to experiment and come up with your own set of “go to” meals that are healthy, tasty, and quick to make.